One of radio’s biggest creative challenges has been the disclaimers that are mandatory for commercials of specific ad categories. The long list of rates, money down, and other qualifiers once considered audio noise contained within auto ads may in fact be influential for those consumers who are in the market to purchase/lease a vehicle. Based upon a recent analysis of auto dealer ads, these along with additional findings can be a game changer for increased revenue opportunities for radio. According to a study released by Cumulus Media, twenty different regional dealership (tier two) sixty-second ads with disclaimers ranging in length from five to twenty-seven seconds were tested and compared to national/manufacturer (tier one) ads. (Manufacturers within the study represented both domestic and foreign brands.) 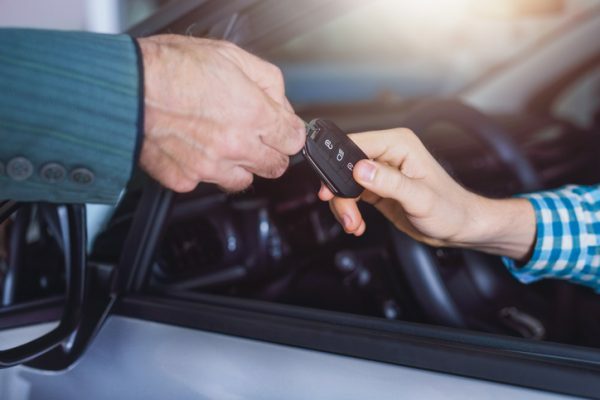 Using Veritonic’s technology to track second-by-second responses for key emotional measures along with purchase intent, 873 panelists ages 18+ who were in the market for a vehicle within the next year were exposed to the ads. The closer the consumer was to the time of purchase, the higher the commercial with the disclaimer scored – up 8% for those in the market within six months versus those that had a longer period (6-12 months). 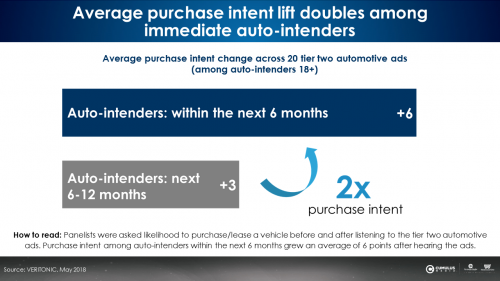 Purchase intent lift doubled among those whose purchase intentions would be within six months. Among those ads which scored higher among panelists (5), purchase likelihood increased 45% versus the lowest ranked ads (5). While disclaimers may have once been considered intrusive or annoying, findings from this study disprove that. Disclaimers can make a positive impact on the influence of radio ads – especially tier two ads. That impact becomes greater as the consumer is closer to that all-important moment of purchase.And the importance of good creative should not be undervalued. This study confirms previous findings regarding the improved effectiveness when creative is pre-tested.You can view the full study here. Previous Previous post: Radio on Main Street Podcast Featuring Dan Vallie, President of the National Radio Talent System.